As we continue to receive updates from the La’Onf Iraqi Nonviolence Group during their third annual Week of Nonviolence, we would like to dedicate this report to the heart-full voice of Iraqi artists and poets. Movements around the world and throughout time have been led, accompanied and inspired by the imagination and beauty of musicians, singers, dancers, poets, painters, sculptors, actors, authors and many others who find creative expression for the essential yearnings of humanity. Below is a message from Bilal, a member of the La’Onf organizing group in Baghdad, sent before the opening of their Art Exhibit on Monday, October 13. We hope these words will ground us in our values as we work to support those struggling for peace and freedom in Iraq. After a few moments after the beginning of Monday morning, our peace doves will fly and color every spot on earth. In spite of all that has happened to us from oppression and bad memories since our childhood…after our dreams get old…our journey will continue…our peace doves will fly to contain all the epics of oppression. The oppression that we lived in… and in spite of the practices of the occupation and the powers of darkness…and the curfew on people…. I wonder what the artist draws in such moments. Today we went out to scream in our loudest voice, and we chant the songs of love…that we live in peace like other nations on this earth…and our scream is a number of paintings that beat with the will of life. What we long for…a life that is full of dignity, freedom, and peace, and in this exhibition we illuminate for you thirty paintings that elaborate on the meanings of nonviolence and peace. 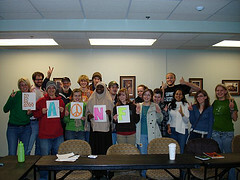 Updates in Arabic, Kurdish and English are on the La’Onf website at www.laonf.net. Photos, video and media updates can also be found at the Peaceful Tomorrows website http://peacefultomorrows.org/ Go to Newsroom for Media updates on LaOnf. Sixth Report on the Week of Nonviolence: LaOnf Week of Nonviolence in Iraq Comes to a Close.